What did I expect? An exceptional, probing character study, rather typical of its time. What did I get? No Hollywood feature in American history ever wore its seriousness of intent on its sleeve as ostentatiously as Francis Ford Coppola’s The Conversation. Good for us that Coppola’s skills at that moment were developed enough to deliver on his promises — and then some. The quality of The Conversation isn’t really up for debate — one surmises that it may have dated, à la Antonioni’s Blow Up, but it’s far too thoroughgoingly conceived and brilliantly executed for that. Verging on unwitting parody of “thinking person’s cinema,” The Conversation achieved a singular status — it was the one movie from the early 1970s that everyone could point to and say, “This is a writer/director’s personal vision; it is experimental and yet formally airtight; it is compelling and surprising and inevitable, as all great drama must be.” In no small way, The Conversation was engineered, with as much dedicated focus as its protagonist invests in his eavesdropping assignments, to be undeniably satisfying to any intelligent filmgoer. Given any acceptance of its assumptions, there’s no way it can miss, it’s that relentlessly and fully realized. Midway through the movie, a professional rival memorably toasts Harry Caul as “the best bugger on the West Coast”; Harry’s predicament is his newfound inability to compartmentalize, and the fallout will eventually ravage his ability to function. 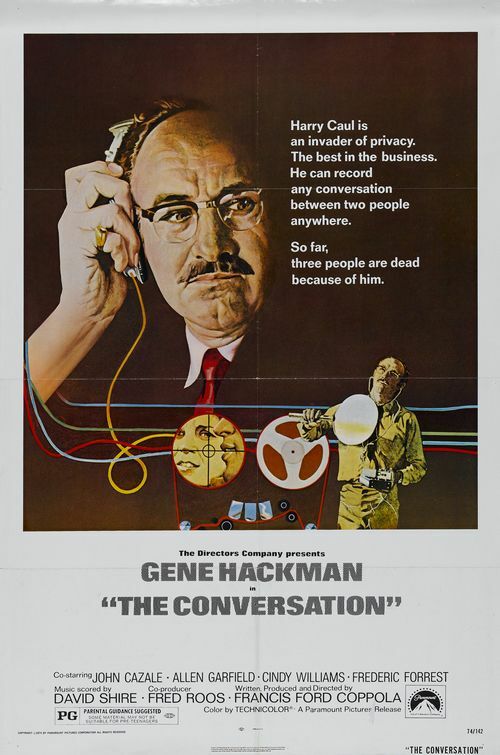 Hackman’s fidgety performance is a tour de force of barely suppressed rage; you have to admire Hackman’s guts in playing Harry as such a repellent grouch. And yet, and yet — we’re still drawn to him, scowls and all; the proof of Hackman’s actorly finesse resides in his not distancing us, much. The advisability of neutral detachment in a surveillance operative is presented as a given, but Harry’s pride as a master craftsman — in other words, his ego — disables that option. The Conversation may be “about” paranoia, but it’s also Coppola’s portrait of the artist — if not his apologia. By focusing on a surveillance professional, Coppola pulls off the neat trick of crafting a movie about conspiracy in which the number of obviously far-fetched elements is close to zero. The subjective nature of Harry’s hell is consonant with the fundamentally European feel to the proceedings; in an age in which American filmmakers were busy fetishizing naturalism, Coppola uncorked an unapologetically expressionistic masterpiece that could reside honorably alongside Bergman’s Persona or Fellini’s 8 1/2. The tragedy of Coppola, and more importantly of American cinema, is that he failed to sustain the excellence staked out in the first two Godfather movies and The Conversation. Just as The Godfather does, The Conversation produces a vortex in which cynicism and naiveté each becomes the other’s fun-house image. (Among filmmakers, Coppola has the most to say on the hazards of American cynicism.) When I reviewed The Godfather, I noted that the movie exploited the audience’s basic need to know things, to exhibit knowingness, in order to create a dynamic “in which every reaction is either too cynical or not cynical enough.” One can see the same problematic operating in Harry, so inured to cynicism that he dangerously assigns himself a moral role in the affairs of his clients. Indeed, his very hardness and cynicism create the conditions for his inexorable drift into a reckless credulity — only someone with Harry’s deep experience with secrets would risk plunging into the icky swamp of his masters’ morality as he does. Explicitly introduced as a cipher, Harry literalizes that identity by the end of the movie. What here smacks of 1974? The blips and blorts of the (very impressive) sound design.